Can you really learn to code in 30 days? Who says you need 10 years to become a good programmer? You can get surprisingly good at something with just 20 hours of focused, dedicated work. Over 60,000 students have taken One Month courses and gone on to build amazing businesses and careers. "One Month helped me launch an app that would have cost $20,000 using a Rails developer. I built it myself in a weekend." "One Month has been such an awesome intro to programming, and I'm discovering that I love it!" 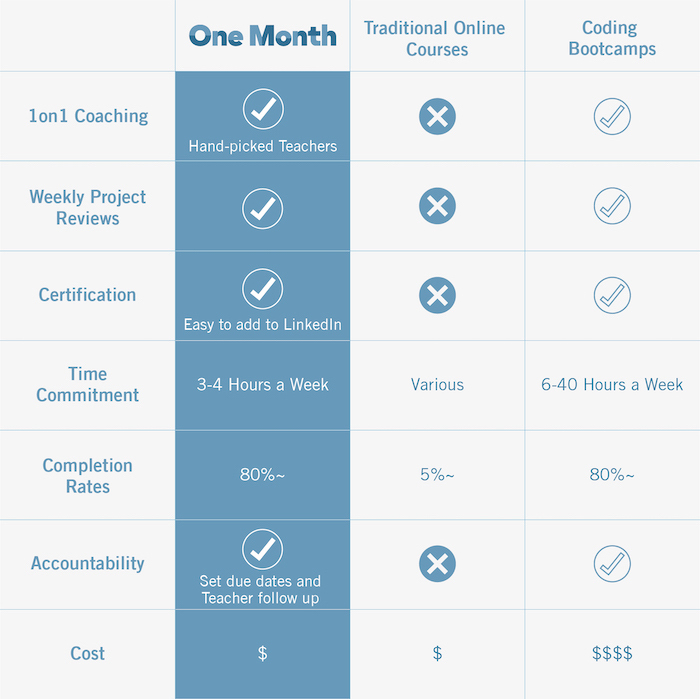 "One Month is the best place to learn programming. The teachers are phenomenal. People from all backgrounds can grasp the concepts." "The best way to learn is to do, which is why One Month is so great. You watch, you do, you repeat. It's the best way to make things stick"
"I changed my life with a new career in just 6 months." "I've traveled a steep learning curve thanks to Chris' friendly and lucid style of teaching!"